Information on the next order date can be found on the Next order date page. After ordering, the products will take 2-3 weeks to arrive here at the CVM, at which point it will be delivered to student mailboxes. You can also opt to pick up your merchandise at our prearranged "pick-up" day. Do I have to pay at the time of pre-ordering? Yes, in order to have accurate pre-order numbers, we do require payment at the time the order is placed. PayPal, Visa, Mastercard, Discover card, and American Express are all accepted forms of payment. The host-site used for our store uses PayPal, but you can always choose the "checkout as a guest" and enter credit/debit card information! Will I receive confirmation of the receipt of my pre-order? Yes, when your pre-order is placed and you check-out, an email will be sent to you confirming payment received and the products you ordered. I entered a shipping addressed when I paid for my order. Does that mean you'll ship the product to me. No, unfortunately we cannot ship items to individual places of residency, even though a shipping address is required for checkout. Your product will we shipped to the NC State College of Veterinary Medicine. 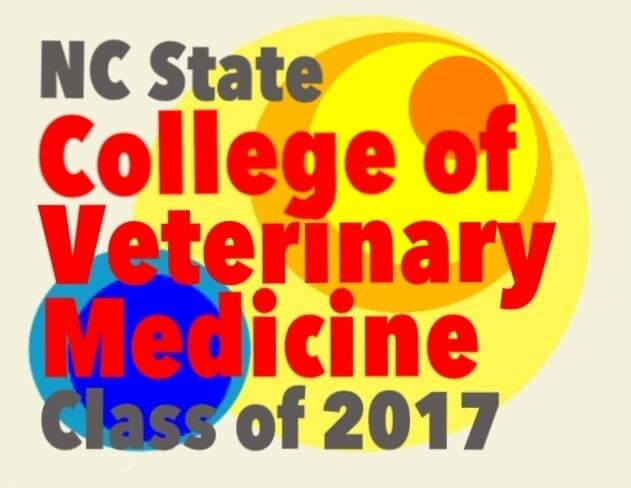 If you are not a student or faculty member of NCSU CVM, you will need to either give us your contact name at the school or plan to come pick your merchandise up during our "pick-up day". Do you sell c/o 2017 merchandise anywhere else? Yes we do! The class of 2017 does a variety of fundraisers throughout the year, and we usually have merchandise for sale at these. We'll also have merchandise for sale at the NC State Fair in October 2014. We also sell every Monday and Wednesday at lunch outside the SCAVMA office at the SCAVMA Store at lunch. If you'd like to pay with something other than a credit card or a PayPal account, find Brandon Armwood, c/o 2017. He will take your order and your money.